Interactive ray tracing applications running on commodity hardware can suffer from objectionable temporal artifacts due to a low sample count. We introduce stable ray tracing, a technique that improves temporal stability without the over-blurring and ghosting artifacts typical of temporal post-processing filters. Our technique is based on sample reprojection and explicit hole filling, rather than relying on hole-filling heuristics that can compromise image quality. 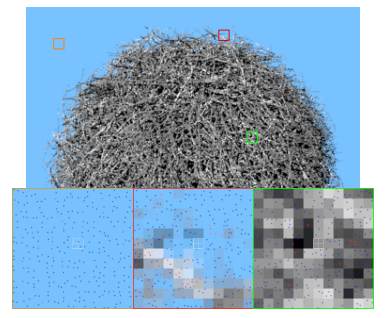 We make reprojection practical in an interactive ray tracing context through the use of a super-resolution bitmask to estimate screen space sample density. We show significantly improved temporal stability as compared with supersampling and an existing reprojection techniques. We also investigate the performance and image quality differences between our technique and temporal antialiasing, which typically incurs a significant amount of blur. Finally, we demonstrate the benefits of stable ray tracing by combining it with progressive path tracing of indirect illumination.